Under the Canadian constitution, the power to establish criminal law and rules of investigation is vested in the federal Parliament. The provinces share responsibility for law enforcement (although provincial policing in many jurisdictions is contracted to the federal Royal Canadian Mounted Police), and while the power to prosecute criminal offences is assigned to the federal government, responsibility for prosecutions is delegated to the provinces for most types of criminal offences. Laws and sentencing guidelines are uniform throughout the country, but provinces vary in their level of enforcement. Crime rates in Canada were reported at 5,334 incidents per 100,000 inhabitants with violent crime at 1,098 incidents and property crime at 3,245 incidents (per 100,000). The province with the lowest crime rate in 2017 was Quebec with 3,359 incidents per 100,000 followed by Ontario with 3,804 incidents per 100,000. The province with the highest crime rate for 2017 was Nunavut with 34,948 incidents per 100,000. Overall crime decreased 23% between 2007 and 2017 with all provinces experiencing a decrease in crime (up to 34%) with the exception of Yukon which saw no decrease and Nunavut which saw an increase. Violent crime was lowest in Prince Edward Island followed by Ontario and Quebec. The three northern territories have higher per capita crime rates than any province. Canada's homicide rate per capita (per 100,000) inhabitants has been declining since a peak in the 1970s. After dropping to a low point of 1.44 homicides per 100,000 inhabitants in 2013, Canada's homicide rate has been rising again . In 2015 the rate rose to 1.68 per 100,000 people, up from 1.47 the previous year. Statistics Canada data released on 2016, police reported 611 homicides across Canada in 2016, a rate of 1.68 per 100,000 people.. Canada's national homicide rate 2017 was the highest it's been in a decade, Statistics Canada says, because of a spike in gang-related violence and shootings. The agency said there were 660 reported homicides in Canada last year. Not only was that an increase of nearly eight per cent from 2016, it also pushed up the homicide rate to 1.8 victims for every 100,000 people -- the highest since 2009. The agency also said the rates of other serious offences, including attempted murder, sexual assault, robbery and aggravated assault were all up last year, as was the use of guns in violent crimes. Police reported criminal violence is thought to be an undercount of actual violence rates. Thus, approximately every five years, Statistics Canada conducts a survey of victimization in Canada. The last General Social Survey conducted was in 2004, where 24,000 people were contacted by telephone: 106 reported incidents of violence per 1,000 polled, which is slightly lower than in 1999 when it was 111 per 1,000 polled. In 2007, the number of murders dropped to 594, 12 fewer than the previous year. One-third of the 2007 murders were stabbings and another third were by firearm. In 2007, there were 190 stabbings and 188 shootings. Handguns were used in two-thirds of all firearm murders. Seventy-four youths were accused of murder, down 11 from the previous year. About eighty-four percent of murders were done by someone known to the victim. Male victims of homicide were most likely to be killed by an acquaintance, someone known to them through a criminal relationship, or a stranger. Female victims of homicide were most frequently killed by a current or former intimate partner, or another family member. The province with the highest crime rate was Manitoba while the lowest crime rates occurred in Prince Edward Island and Newfoundland and Labrador. Crime statistics vary considerably through different parts of Canada. In general, the eastern provinces have the lowest violent crime rates while the western provinces have higher rates and the territories higher still. Of the provinces, Manitoba and Saskatchewan have the highest violent crime rates. The chart below also shows that Saskatchewan has the highest provincial assault rate, and that Manitoba has the highest provincial sexual assault rate, robbery rate and homicide rate of any Canadian province. In many instances the crime rates in the Yukon, North West Territories and Nunavut are the highest in the country and can be up to ten times the national average. 2016 crime statistics for the provinces and territories are given below, as reported by Statistics Canada. Map of Police per 100,000 population across Canada, 2012. In 2005, there were 61,050 police officers in Canada which equates to one police officer per 528.6 persons, but with significant regional variations. Newfoundland and Labrador and Prince Edward Island have the fewest police per capita with 664.9 and 648.4 persons per police officer, respectively. Conversely, the highest ratio of police to population is found in Canada's northern territories; Nunavut has 247.9 persons per police officer, the Northwest Territories has 248.5 persons per officer and the Yukon has 258.2 persons for each police officer. That is a substantially lower rate than most developed countries with only Japan and Sweden having so few police officers. The United States has one officer per 411.5 persons, and Germany 344.8. Canada's national police force is the Royal Canadian Mounted Police (RCMP) which is the main police force in Canada's north, and in rural areas except in Quebec, Ontario, and Newfoundland. Those three provinces have their own provincial police forces, although the RCMP still operate throughout rural Newfoundland and also provide specific federal policing services in Ontario and Quebec. Many cities and districts have their own municipal police forces, while others have contracts with the provincial police or RCMP to police their communities. A publication posted on Statistics Canada reported that in 2009, only a small portion of crimes that happen are reported to the police (31% of all crimes), and this figure has been lowering from 1999 (37%) and 2004 (34%). Only 54% of break and enters, 43% of robberies, and 34% of assaults are reported to the police. The most common reason for not reporting a crime was the victim thought it was not important enough (68%). Other common reasons include; they think the police cannot do anything about it (59%), or they dealt with it another way (42%). Multiple reasons are given so the percentages do not sum to 100%. 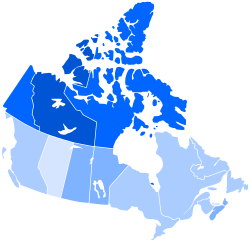 Canada abolished the death penalty for murder in 1976, instituting a mandatory sentence of life imprisonment for murder. In 2001, Canada had about 32,000 people in prison or about 0.13% of the total population. Globally, the United States was the country with the highest percentage of inmate population (about 0.7% of the total population). The European average is 0.2% of the total population, with France and Germany having lower rates than Canada, but with the United Kingdom, Spain and most of Eastern Europe having higher ones. Comparing crime rates between countries is difficult due to the differences in jurisprudence, reporting and crime classifications. National crime statistics are in reality statistics of only selected crime types. Data are collected through various surveying methods that have previously ranged between 15% and 100% coverage of the data. A 2001 Statistics Canada study concluded that comparisons with the U.S. on homicide rates were the most reliable. Comparison of rates for six lesser incident crimes was considered possible but subject to more difficulty of interpretation. For example, types of assaults receive different classifications and laws in Canada and the U.S., making comparisons more difficult than homicides. At the time, the U.S. crime of aggravated assault could be compared to the sum of three Canadian crimes (aggravated assault, assault with a weapon, and attempted murder). This comparison had a predicted bias that would inflate the Canadian numbers by only 0.1%. The study also concluded that directly comparing the two countries' reported total crime rate (i.e. total selected crimes) was "inappropriate" since the totals include the problem data sets as well as the usable sets. For reasons like these, homicides have been favored in international studies looking for predictors of crime rates (predictors like economic inequality). Much study has been done of the comparative experience and policies of Canada with its southern neighbour the United States, and this is a topic of intense discussion within Canada. Historically, the violent crime rate in Canada is far lower than that of the U.S. and this continues to be the case. For example, in 2000 the United States' rate for robberies was 65 percent higher, its rate for aggravated assault was more than double, and its murder rate was triple that of Canada. However, the rate of some property crime types is lower in the U.S. than in Canada. For example, in 2006, the rates of vehicle theft were 22% higher in Canada than in the U.S. 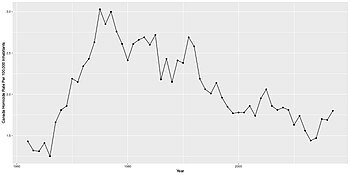 The homicide rate in Canada peaked in 1975 at 3.03 per 100,000 and has dropped since then; it reached lower peaks in 1985 (2.72) and 1991 (2.69). It reached a post-1970 low of 1.73 in 2003. The average murder rate between 1970 and 1976 was 2.52, between 1977 and 1983 it was 2.67, between 1984 and 1990 it was 2.41, between 1991 and 1997 it was 2.23 and between 1998 and 2004 it was 1.82. The attempted homicide rate has fallen at a faster rate than the homicide rate. In more recent years, the U.S. as a country still typically has higher violent crimes rates. In 2012, the homicide rate in the U.S. was 4.7 per 100,000 residents, Canada's was 3 times lower at 1.6. However the chances of being murdered at random are extremely low in both countries. In Canada, only 15% of murders are committed by strangers, in the U.S. this number is very similar at 14%, meaning in 50 years your chance of being murdered at random is 0.000128% in Canada, in the U.S. it is 0.000329% (of course these numbers would vary by neighborhoods within each country). Certain methods of homicide are used more frequently in each country; in Canada (0.59), stabbing homicides occur 51.3% more often than in the U.S. (0.39), however firearm homicides occur 440% more in the U.S. (2.7) than in Canada (0.5). In the U.S., you are 3 times more likely to die being shot (17.4%) than being stabbed (5.3%). Beyond homicides, the U.S. (112.9) has a higher robbery rate - 42.2% higher than Canada (79.4). Other violent crimes such as physical assaults or sexual assaults are not very comparable between the countries because of different definitions of the crimes. The disparity in property crime is not as large, however it still exists. The burglary/break-in rate in the U.S. (670.2) is 33.1% higher than in Canada (503.7), the theft rate in the U.S. (1959.3) is 33.4% higher than in Canada (1468.4), and the auto-theft rate in the U.S. (229.7) is slightly higher than the rate in Canada (223.5). ^ Statistics Canada (February 8, 2017). "Population size and growth in Canada: Key results from the 2016 Census". Archived from the original on February 10, 2017. Retrieved February 8, 2017. ^ "Top 16 Worst Major Cities in Canada by Crime Rate 2019". Immigroup. Retrieved 2019-02-17. ^ Brazeau, Robyn; Brzozowski, Jodi-Anne. "Violent victimization in Canada" (PDF). Statcan.ca. p. 1. Archived (PDF) from the original on 2012-03-17. Retrieved 2017-08-20. ^ "Table 4 Police-reported crime severity indexes, by census metropolitan area, 2009". Statcan.gc.ca. Retrieved 20 August 2017. ^ "Police-reported crime statistics: Table 3 Police-reported crime severity indexes, by census metropolitan area, 2010". Statcan.gc.ca. Retrieved 20 August 2017. ^ "Table 3 Police-reported crime severity indexes, by census metropolitan area, 2011". Statcan.gc.ca. Retrieved 20 August 2017. ^ Canada, Government of Canada, Statistics. "Description for chart 9 Police-reported Violent Crime Severity Index, by census metropolitan area, 2012". Statcan.gc.ca. Retrieved 20 August 2017. ^ Canada, Government of Canada, Statistics. "Table 3 Police-reported Crime Severity Indexes, by census metropolitan area, 2013". Statcan.gc.ca. Retrieved 20 August 2017. ^ Canada, Government of Canada, Statistics. "Table 3 Police-reported Crime Severity Indexes, by census metropolitan area, 2014". Statcan.gc.ca. Retrieved 18 November 2017. ^ Canada, Government of Canada, Statistics. "Table 3 Police-reported Crime Severity Indexes, by census metropolitan area, 2015". Statcan.gc.ca. Retrieved 18 November 2017. ^ Canada, Government of Canada, Statistics. "Table 3 Police-reported Crime Severity Indexes, by census metropolitan area, 2016". Statcan.gc.ca. Retrieved 18 November 2017. ^ a b "Table 35-10-0177-01 Incident-based crime statistics, by detailed violations". Statcan.gc.ca. Retrieved June 17, 2018. ^ "Police officers by level of policing, by province and territory, 2012" (PDF). Statistics Canada. Retrieved 2014-03-03. ^ "Police personnel". Statistics Canada. Archived from the original on September 26, 2006. Retrieved 2006-10-09. ^ "Police officers, by province and territory". Statistics Canada. Archived from the original on 2006-09-09. Retrieved 2006-10-09. ^ "Table 10 Self-reported victimizations reported to police, 1999, 2004 and 2009". Statcan.gc.ca. Retrieved 20 August 2017. ^ a b "Criminal victimization in Canada, 2009". Statcan.gc.ca. Retrieved 20 August 2017. ^ "Executions in Canada from 1860 to abolition". Capitalpunishmentuk.org. Retrieved 14 May 2015. .
^ Feasibility Study on Crime Comparisons Between Canada and the United States Maire Gannon, Canadian Centre for Justice Statistics, Statistics Canada, Cat. no. 85F0035XIE. Retrieved June 28, 2009. ^ a b Canada, Government of Canada, Statistics. "Crimes, by type of violation, and by province and territory (Newfoundland and Labrador, Prince Edward Island, Nova Scotia, New Brunswick)". Statcan.gc.ca. Retrieved 20 August 2017. ^ "2011 Census QuickStats : Australia". Censusdata.abs.gov.au. Retrieved 20 August 2017. ^ "Crime in England and Wales, Year Ending December 2012" (PDF). Ons.gov.uk. Retrieved 2017-08-21. ^ "Crime Statistics". Ons.gov.uk. Retrieved 20 August 2017. ^ "Population Estimates for England and Wales". Ons.gov.uk. Retrieved 20 August 2017. ^ "Garda Recorded Crime Statistics : 2007-2011" (PDF). Cso.ie. Retrieved 2017-08-21. ^ "Irish population in 2011 at highest in 150 years". Finfacts.ie. Retrieved 20 August 2017. ^ "New Zealand Crime Statistics 2012" (PDF). Police.govt.nz. Retrieved 2017-08-21. ^ "Wayback Machine" (PDF). 10 December 2013. Archived from the original (PDF) on 10 December 2013. Retrieved 20 August 2017. ^ "Publications". Nisra.gov.uk. Retrieved 20 August 2017. ^ "RECORDED CRIME IN SCOTLAND, 2012-13" (PDF). Scotland.gov.uk. 18 June 2013. Retrieved 2017-08-21. ^ "Scotland Population (2017) - World Population Review". Worldpopulationreview.com. Retrieved 20 August 2017. ^ "Crime Stats SA - Crime Stats Simplified". Crimestatssa.com. Retrieved 20 August 2017. ^ "SA population at 51.8 million - Census". News24.com. Retrieved 20 August 2017. ^ Crime in the United States 2014 By Volume and Rate per 100,000 Inhabitants, 1995–2014. FBI. ^ Criminal Victimization, 2014 - cv14.pdf. US Bureau of Justice Statistics. ^ Christopher Effgen (2001-09-11). "United States Crime Rates 1960 - 2008". Disastercenter.com. Retrieved 2010-06-30. ^ a b "Bureau of Justice Statistics Key Facts at a Glance Homicide Rate Trends". 24 October 2006. Archived from the original on 24 October 2006. Retrieved 20 August 2017. ^ "85-002-XIE2006006.indd" (PDF). Statcan.ca. Retrieved 20 August 2017. ^ "Wayback Machine" (PDF). 11 April 2008. Archived from the original (PDF) on 11 April 2008. Retrieved 21 August 2017. ^ Crime in the United States 2012. By Volume and Rate per 100,000 Inhabitants, 1993–2012. FBI. ^ "Homicide in Canada, 2011". Statcan.gc.ca. Retrieved 20 August 2017. ^ "Homicides, by most common type of method, Canada, 1961 to 2011". Statcan.gc.ca. Retrieved May 5, 2014. ^ "Expanded Homicide Data Table 8: Murder Victims by Weapon, 2008–2012" (XLS). Fbi.gov. Retrieved May 5, 2014. ^ "Are stab wounds as dangerous as gun shot wounds?". 16 November 2014. Archived from the original on 16 November 2014. Retrieved 21 August 2017. André Cédilot; André Noël (2011). Mafia Inc.: The Long, Bloody Reign of Canada's Sicilian Clan. Random House Digital, Inc. ISBN 978-0-307-36042-7. Correctional Service Canada (commonly called Corrections Canada) administers federal prisons and parole boards.